At several locations in the southern hemisphere there are craters that have been filled with material almost to the top of the crater rim. What the material is and where it came from are still open questions, and may not even be the same process from crater to crater. 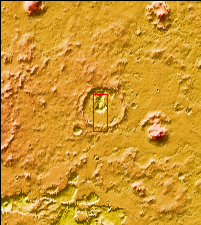 In several of these filled craters there are canyon like features where the fill material has been removed or eroded. Sometimes the depressions parallel the crater rim, but in other cases the depression is in the center of the crater and is usually linear. A ring of gullies encircle the top of the depression in this crater. This unnamed crater is located in southern Noachis Terra.